Thank You for visiting this page, you can click any link below of your interest ! Create domains and set up Web hosting using Systron Plesk Panel. Our fully managed/unmanaged hosting services provide you with best in class security, top most performance, and highest reliability. Our technical support team is available round the clock so you can rest assured and focus on your business. We are In Hosting Services Industry since 1997, offers Most reliable, Industry`s best priced, excellent quality high performance Dedicated Servers, Cloud Based VPS Fully Configurable, SAN Disk based VPS Hosting, Linux Shared Hosting and Windows Shared Hosting . Unparalleled dedicated 24X7 support, clients retentions 95% since decade now. Industrial grade DC with multiple connections able to maintain 100% network up-time. We also Offer Domain name registration for over 900+ domain extensions. We also sells variety of SSL Certificates to suit everyone. 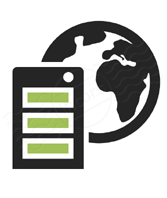 Order dedicated server with confidence.